Charlie Praying! Isn't he just wonderful? He will be available for you to purchase on February 1st! Come see us at www.cleardollarstamps.com on February 1st and add Charlie Praying to your collection! Sneak peaks for February 1st! Sweet Jesus. Isn't candy the perfect way to tell someone Jesus loves them? And so easy to hand out! Sweet Jesus is the name of the set coming out February 1st! I am so excited about this set.....you're going to love it! Take a look at just a few of the stamps that are included in this set! 1. Cut your Mocha Divine to 4x8, Baja Breeze to 3 7/8 by 3 7/8, patterned paper to 3 3/4x3 3/4. Layer as shown in the photo, wrapping the ribbon around the blue and patterned paper BEFORE adhering it to the Mocha cardstock. 2. Punch out 2 1/8 inch circle, punch out coordinating 2.5 inch scallop circle (I use a McGill punch and the Scalloped Nesties dies). 3. Stamp the Tis so Sweet circle on your white circle with Cranberry Crisp. Brown the outer edges with a brown stamp pad. Use pop up foam pieces to adhere to the scalloped circle. Center your circle medallion over your ribbon. 4. Apply the burgundy Stickles to the scallops of the circle. 5. Cut a white piece of cardstock 3 7/8 x 3 7/8. Cut patterned paper to 3 7/8 x 3/4. Assemble as shown on the inside of the card. 6. Punch a 1 inch circle out of white. Stamp God's Sweet on You in Cranberry Crisp. Trim the circle off as shown. I rubbed the edges of the little tag with a blue ink. Apply to inside of card as shown. 7. The little jar is one that I found at Hobby Lobby and forgot I had....what a nice surprise! Create your circle for the jar the same as above and assemble as shown. 8. The Hershey Nuggets have a 1 x 3 inch piece of patterned paper wrapped around them and the same sentiment as made for the inside of the card. What a nice little gift set this makes! Isn't this the cutest little tin to pass on to someone? I'm trying to decide if I should carry some of these little tins in the store! Isn't this the cutest little treat box? I put different nuts in each little box....I really wanted three sections, but only had two kinds of nuts. 1. Fill boxes with assorted nuts. Use the Scor-pal tape to attach them to each other. 2. Cut ribbon to wrap around your boxes. I took the twill tape, laid it on my chocolate ink pad, held it lightly with one finger on the ink pad, and pulled it until the whole strip was covered in the brown....giving it a woodgrain look! I love it! Wrap the ribbon around your box and tape down with your Scor-Pal tape. 3. Stamp your little squirrel on the white cardstock, color in with your copics. His little cheeks I completely colored in with the medium brown copic color, then I took the Salmon and colored the circles in which pushed the brown out to the sides.....very nice! 4. Layer your pieces as shown. I put pop up dots between the white and brown layers to make it pop it up a bit! This is a super simple little treat to give someone who is going through a hard time. First, I used two sided tape to stick the Crunch bars to the red cardstock, slid that into the box, put a little red paper filler on each side. The red cardstock band is 3/4 inch wide and wraps around the box to tape underneath the rectangular piece. Very, very, simple! Don't forget, this set is released on Sunday! Good morning friends, its Katie here to share the cutest little treasure chest ever. I first saw these while I was browsing online as little party favors and thought they would make the "cutest" anything. But for today, I am focusing on a Valentines Treasure Chest filled with goodies for family or friends. Start with 9" x 6" piece of cardstock. This will become your box section. Lori has both the clear wheel rollers as well as a multitude of acrylic blocks available at the store. I wanted to show you that both work beautifully depending on your mood. The roller is available in a 1" and 2" width. Now this is where I differ a bit. The wheel comes with a cover that exposes a sticky layer that can be replaced, but I found that the plastic cover actually holds the stamp just fine. When needed, I'll get down to that sticky layer eventually. The roller is super quick, but the width of your paper will limit its usefulness. Just apply to the wheel and get ready to go. Make sure to start rolling at the end that will be moving forward. The block works just as well too. 1/2 has been stamped with the wheel and the other 1/2 with the block. Along the 9" side score at 2" and 4" - Its important that you score these measurements first. Along the 6" side score at 1", 3", 6", and 8" BUT.... make sure to look at the next photo!!! For the 1" and 8" score marks only score to the 2" and 4" score lines - don't score the entire length. Next, cut along the scored lines as shown in the picture below. Now, you'll create the 1/2 circle for the sides. This is where your coluzzle makes it easy, but you could manage this with a similar sized circle. Just outline and cut by hand. Now, you'll have to clean up your cut a bit and cut on the dotted lines. Here's your box all ready to go. Just fold and apply adhesive. Now for the lid. Cut a piece of cardstock to 3" x 10 1/2"
Along the the 3" side score at 2" and 4". This will become your front and bottom. At this point, I decided to added a bit of contrast with some white cardstock and used the Martha Stewart punch to create the lattice. Now, I used velcro to attach my lid to my chest and I use ones that I find at Walmart. They are the thinnest. Attach the pieces together and then remove the adhesive cover on one side and attach to the lid. Then remove the other adhesive cover. Lower the lid so that it covers the sides and front. Now for the keyhole. You'll need some sort of punch, I've used the Making Memories Eyelet punch. Punch your cardstock with the heart and then attach it to another piece of cardstock. Now trim around the heart. Now punch a hole with the eyelet hole punch towards the top of the heart. I then sketched the rest of the keyhole. The finished Valentine Treasure Chest Treat Holder. These little treasure chests are super easy to make and lots of fun. Make a bunch for Valentine's Day, but don't forget about all those great holidays coming up. This next one was made with the teacher in mind and is made with some really fun spring colors. Thanks once again to all that visit. It is much appreciated and I hope this provides you with a great bouncing board! Enjoy your day. This is Katie signing off for Clearly iStamp Blog. It's time for more Valentine's talk! As I was trying to decide what little Valentine's I wanted to make this week, I decided I was going to do a little Valentines Treasure Hunt! My girls just love treasure hunts, and since Valentine's is on Saturday this year, it worked out perfectly! Now, a treasure hunt involves a lot of stops and a lot of clues. Therefore, the little treats or clues needed to be very simple, quick, and easy to make. So here is what I came up with....my girls love cats and dogs, so I chose the dollar stamps to make these quick little treats! What is great about these is that you can use up some of those scraps of paper that have been laying around waiting for the right project! 1. Hide them around like an Easter egg hunt. 2. Place a clue with each treat that leads them to the next treat. This hunt is not just for kids! This hunt would be perfect for Sunday School Classes, offices, husbands, and friends! Adhere your candy with glue dots or double sided tape to your paper. Staple or tape the top together. Punch holes and tie ribbon at the top....how simple is that???? This little porcupine was stamped right on the printed paper and colored with copics! I thought it turned out really cute! This made it look kind of transparent....and a lot quicker! This could always be the reward at the end of the hunt! Box in picture is here. I hope you've enjoyed my simple Valentine's samples and they get you motivated to get started! I'm off to CHA (Craft and Hobby Association trade show) to see what new stuff I can find for us to play with next! Who won this week? Congratulations Kimberly! Email me at Lori@cleardollarstamps.com to claim your prize! Hi everyone, its Katie here for this week's Stamp Spotlight. Along with featuring this really cute stamp set, I will also be addressing the use of watercolor pencils again. But let's take a look at this set called Ballerina. Out of all the sets of ballet stamps I looked at this one spoke to me and I knew that I had to have it. As a mother of three boys, I didn't need this set for me, but fortunately for me I have lots of friends with very cute little girls. This set contains 13 images and retails for only $9.99. Like I mentioned, I am going to continue to look at the use of watercolor pencils as well as watercoloring with your ink pads. Here is a photo of the items I used with ONE EXCEPTION: In the photo, I have the Memento Tuxedo Black ink pad which worked great for last weeks tutorial, but it bleeds too much when using water. I exchanged that ink with Versafine Black Onyx Ink for this week's coloring. Last week I used a blender pen and a waterbrush, but I applied my watercolor pencils to my stamped image first and then essential spread/blended the colors over the image. This week, I wanted to add dye based inks to the mix as well featuring the "opposite" method of applying color to my stamped image - ink to waterbrush and then to paper. For those of you who have ink pads that are connected all you have to do is squeeze the ink pad together when its closed and you will end up with ink on the lid. From there you will apply your waterbrush to the ink on the lid and start coloring your image. For those of you who have ink pads where the lids come off you can touch your ink pad to your lid or grab an old CD and tap your ink pad to the CD and you will get the same transference of ink. And just like last week, I wanted to do a sample and see what the colors would like like on my example cardstock and watercoloring paper. When using the watercolor pencils, its the same method. Just apply the waterbrush to the tip of the pencil until you can see the color on the waterbrush. Here is an example of of both ink pads and watercolor pencils. Not too terribly different except that the watercolor paper seemed to keep a slightly more intense color. In this picture, I started coloring with the watercolor pencils - you can definitely see the actual color on the brush tip. Another component to the watercolor pencil is that you can get a pretty thick color paste onto the tip of the waterbrush from the watercolor pencil. It completely depends on how much water is on the tip of the waterbrush. If you wanted less intensity add more water. If there is too much water, just dab on a paper towel or pinch with your fingers. Here is a picture using my ink pads with the waterbrush. You can definitely see a difference in the look of the two images. Here I have a side by side of each. One more note that I didn't mention above. When cleaning off your waterbrush all you have to do is use a spare piece of paper and essential color the color right out. You can see that it just disappears as you go. Here I've added a picture of a different waterbrush I own. It has a wider and flatter tip and is great for large areas and in this case, I used it to color the edges of my card base. And here, I used it to create a brushed/colored look around the border of my stamped image. I started at the edge and brushed inward. Just a nice subtle touch and addition of color. Now, for the fun part. Lori has some neat colors of mulberry paper at Clear Dollar Stamps and I thought it would look so cute with my cards. Mulberry is meant to be torn, but what I did first was run it through my cuttlebug and used my oval nestability to cut out an oval and then I took my waterbrush and got the edges (a nice even border) very wet. The I just tore the edges away for that perfectly soft fringed look. Here is my finished card - perfect for that little ballerina or want to be ballerina! For this card, I used the word stamp to create my own background and use lavender as my main color. I used my long rectangle nestabilities to cut out my ballet slippers. The "happy birthday" is a sentiment from my Lamppost Expressions stamp set and then added just a bit of stickles for a little extra bling on the crown. Now for my last card for the day. I used white mulberry paper for my background and since its slightly transparent, I love how the dark pink cardstock shades the mulberry paper into looking like a light pink. Again, I cut the mulberry paper with my paper cutter and then added water to the edges to get the softer look. But... I also used some chocolate mulberry paper to create the oval scallops around the ballet slippers. This stuff cuts great with the nesties. Thanks to everyone who visits and I hope you enjoyed it! I have to admit that I really enjoyed using the waterbrush in the manner above and will definitely continue with this method. I hope you give it try if its new too you and as always, I'll take any tips/tricks/hints that you might have to share. I've been getting requests, lately, for simple, anybody can do it, stamped samples.....so here you go! I decided it was time to get started on Valentine's planning! I decided to go with quick and easy samples that were easy to reproduce and mass produce! Here are the first samples, and I'll be working on more this next week to share with you! Clear Baggies for candy - these can be found the cheapest at Walmart with the beading supplies. 2. Tape or glue your layers together. 3. Punch a scallop circle out of the base layer of the card. Punch a circle in white cardstock (this one is 1 1/2 inch). 4. Stamp Simon kitty in the middle of the white circle and color to match your cardstock. I rubbed the edges of my white circle in a coordinating ink pad color. 5. Glue/tape the two pieces together. Glue/tape to front of the card centered horizontally, but to the top vertically so you have room to punch your word window. 5. Use your Stampin Up Word Window punch to cut out a window for your words. If you don't have this punch, don't worry! It is just as cute to stamp your message directly on the patterned cardstock or stamp it as your inside sentiment! 6. Stamp your Purrfect Friends from Critter Messages through the window to make sure you get perfect placement. 2. Cut your base cardstock color 3x4 and fold the 4 inch direction in half so your front is 2x3. 4. Follow the same directions as above to create your kitty piece and adhere it to your bag topper. I used foam pop up dots to adhere mine to give it some dimension. 5. The punch out from your card word window creates the little word tag on the baggie. 6. I used the Scor-tape to adhere the bag topper to the baggie by putting a piece on the bottom of both sides of the bag topper and sandwiching the baggie in between. 7. Adhere the little word window cut out piece to the baggie with the scor-tape. I was thinking about these for my daughters' classes....but I can't give pink kitties to the boys, so this set is for the boys! Sammy Seal gets some action this Valentine's season when paired with his saying from the Critter Messages stamp set! The top one is the one I ended up with. I got the bottom one done and thought it was so boring! I just included this to prove to my beginner stampers that not every sample is perfect, but you learn as you stamp and develop your style! 1. Cut a piece of cardstock 3 1/8 x 3 1/8. 2. Use your Scor Pal to score your paper at 1, 2, and 3 inch marks. You don't have to score, but makes the fold much cleaner. 3. Next put a piece of you Scor-tape on the middle large section. Stick your three kisses to the double sided tape. 4. Put another piece of 1/8 inch scor-tape on the outer 1/8 edge. Fold it over and adhere it to the other end of the triangle piece you are creating. 5. Now you can play around decorating your Seal Kisses pouch! Use my samples, or come up with your own! 1. Stamp Claudette Camel on the yellow paper from your BG paper pack. Trim out. 2. Glue your cut out camel to your Buckaroo Blue cardstock and trim as shown. 3. Cut a 1 1/2 circle from the buckaroo blue cardstock. Punch a 1 1/4 circle from some of the cream paper from your BG paper pack. 4. I cut my Camel-ittle closer saying in half (it comes in a straight line) so I could arrange it to fit in my spot. Stamp it on your cream piece of paper. Cut your circle in half, glue on your blue circle and trim it to match. 5. Your base card is 3x3, so cut your cardstock 3x6 and fold it in half. 6. Cut your patterned paper 2 7/8 x 2 7/8. 7. Now you have all your pieces.....you can start assembling as shown above! I hope you enjoy these simple little samples and enjoy making them for yourselves! It's time for Blog Candy again! What is the blog candy this week? $10.00 in Clear Dollar Stamps! What do you need to do to qualify to win? Answer a simple question! What sayings and images would be in a girl TWEEN stamp set? What sayings and images would be in a boy TWEEN stamp set? What sayings and images would be in a girl TEEN stamp set? What sayings and images would be in a boy TEEN stamp set? Thanks so much for your input....and good luck! WINNER MUST CLAIM THEIR PRIZE BY JANUARY 17TH, 2009, or the prize will go to another! 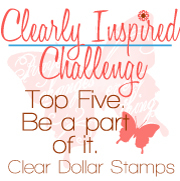 Make a comment on THIS POST and tell me what new products you would like to see Clear Dollar Stamps carry in 2009! Make sure to include your email address so we can email you if you win....this is optional, so if you don't leave your emial make sure to check back! Comments will close on Saturday, January 17th, 2009 at 9 PM. I will use Random.org random number generator to select a winner from the comments on Monday, January 19th, 2009. I will post the winner no later than Tuesday morning, January 20th. How do I organize my stamps?????? I think this is the question of the year! I get many emails about "how do I organize my stamps?" Well, here are a couple of VERY inexpensive solutions! First, I'll show you how I've been doing it....which in the beginning was fine, but now there are so many stamps I can't remember their names to find them! My beginnings were in a plastic drawer from Walmart! Many people put their stamps in CD cases and store them on racks. This can be a very nice system if you have the table or counter space for these. Clear Dollar Stamps has made this system a little more appealing just this month! Starting with January 2009 stamp sets (this will not be done for stamps released prior to January of 2009), CDS is sending a paper copy of your set, as well as a sticker sheet to adhere to your cling sheet or cd case! Now, the problem becomes: How do I know what stamp sets I have and keep them organized! Well, I will share with you this very inexpensive system that I am switching to for 2009! You are going to create a catalog for your stamps! 3 RIng Binder that you can decorate (or create one with your Bind-It-All), preferably one with the clear plastic cover that you can slip a decorated page in to. Plastic page inserts for three ring binders that 8.5x11 pieces of paper fit in to. Cardstocks and coordinating papers that make you feel happy! Punches or Nestabilities - If you have some fine, if you don't, don't worry! Just use what you have and create a cover for your 3 ring binder that is appealing to you! You can create a page tab with anything! 1. First I decorated my binder cover and slipped it in the front. I just typed Clear Dollar Stamps in my Word document and printed it out for my cover. 2. Make your page tabs. a. Punch out a scalloped circle and a coordinating circle that fits nicely inside the scalloped circle. b. Score (or fold) the scalloped circle down the middle and fold in half. c. Cut your white circle in half. d. Tape or sew the white half circle to your green tab piece. e. Stamp your category from Card Categories on your tab. If you like your handwriting you can write it! Next, use some kind of double tape (I used the Scor-tape 1/4 inch) to adhere mine to the plastic page insert. 3. Make your catalog pages. a. Envelopes or CD cases. I am choosing these envelopes, because I don't have a lot of room to store cd case holders or cds, plus the envelopes allow you to store them in a file cabinet, portable file box to take to friend's houses, and is less expensive! b. Permanent marker and tape. c. Copy paper or cardstock to create your catalog page on. Take your paper insert that comes with your Clear Dollar Stamps stamp set and tape it to your catalog page. Assign the stamp set an envelope or CD case number and letter (if you are putting multiple stamp set in one envelope). Write the number and letter by the stamp set paper. Write the number and letter with permanent marker on the plastic baggie the stamp set comes in. Slip the stamp set in the envelope or into the CD case. If you are using CD cases, write the number on the CD case and store in a rack in numerical order. If you are using the envelope system. File your envelopes in numerical order in a file cabinet or a small file box that you can store in a closet, under a bed, and take with you everywhere you go! What if you don't have papers to tape to your catalog pages? Make your own! Take some two sided tape and tape your entire cling sheet to a block. Ink it up as usual and stamp, creating a perfect replica of your stamps! If you don't have a block large enough, lay the stamp set on the cling sheet face up, press your ink pad on the top of your stamps, lay your paper on top of that, and press with the largest block you have (moving the block around until you have covered all the areas)....does that make sense? Or you can do it one by one, oh my! What are the benefits of your catalog system? Your friends, and you, can easily look through your stamps without dragging them all out. You can take your book with you to plan your next stamping project as you sit at the doctor or your kid's events. If you use the envelope system, you are highly portable! You can place sample cards by your stamp sets to inspire you later and remind you of what you have created! I hope this helps with your New Year organizing endeavors!